Missing teeth can negatively affect eating, speaking, and the aesthetics of your smile. They also can also cause your jaw to lose bone mass, your remaining teeth to shift, and your face to suffer alterations in appearance. Dentures restore the look and function of your smile, are custom-crafted just for you, and are easy to maintain. If you are missing teeth, turn to the experienced dentists at Astoria Dental Group in Queens. Dr. Clifford Degel and Dr. Carmen Every-Degel have years of experience crafting custom dentures to help patients speak, eat, and smile with confidence. There are many types of dentures, each designed to remedy specific dental problems. If you are missing only a few teeth, a partial denture may be a great choice for you. If you are missing more teeth, a complete restoration may be needed, but can only be fitted after any remaining teeth are extracted and the gums have healed. We also offer immediate, upper, and over dentures. Immediate dentures are placed immediately after any remaining teeth are extracted, and may need to be adjusted later as your gums heal. Only certain patients are candidates for immediate dentures. Upper dentures replace your upper teeth only. Implant-retained dentures lock onto dental implants placed with the Mini Drive-Lock™ system. Implant-supported dentures provide an excellent restorative solution for patients missing all of their teeth from either jaw or both jaws. Mini implants are slimmer in diameter than traditional implants and can be placed in a smaller or weaker amount of bone. This means that some patients who are not good candidates for traditional implants can benefit from the procedure. Once they are in place, implant-supported dentures are unparalleled in their stability, and are nearly indistinguishable from your natural teeth. At Astoria Dental Group, we offer both traditional and implant-supported restorations. Regardless of type, crafting and fitting dentures is a multi-step process. At our office, we work to make the process efficient and comfortable, while taking all the steps to ensure a superior fit and a natural-looking result. Today’s dentures are natural-looking, more comfortable than ever, and last for decades with proper care. During your first appointment, one of our dentists will take a wax bite impression. 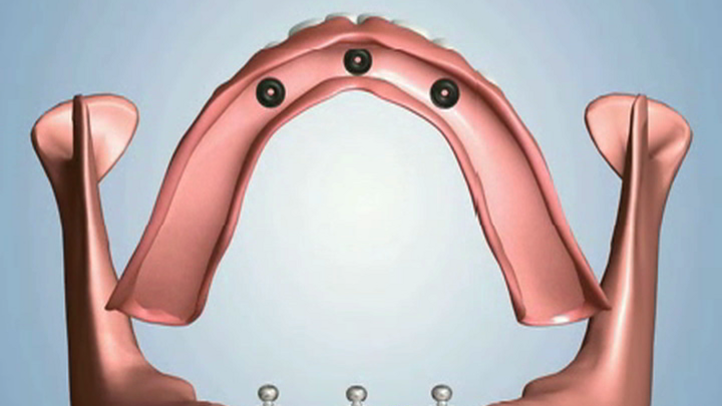 This impression provides exacting measurements of your teeth, gums, and mouth. Next, your restoration will be carefully crafted in a dental lab. During your follow-up appointment, your dentist will work with you to fine-tune the shape, color, and fit. When this process is complete, you should be free to enjoy your dentures for many years to come! We realize that missing teeth are a common problem; fortunately, there is a wide range of great solutions that will give you back your smile! Having served the community for many years, our dentists are experienced in helping patients explore their options, and helping them select dentures that can let them enjoy their lives and smile with confidence. Please contact Astoria Dental Group online today or call (718) 278-1123 to learn more.